Do you use Twitter for your business? Are you wondering how Twitter can help you build relationships? 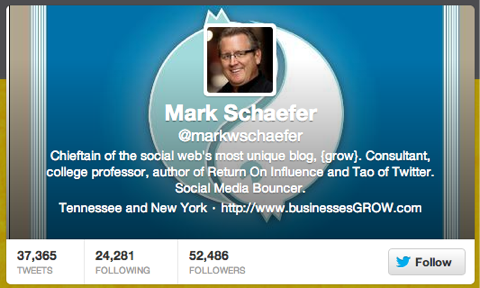 In this episode, I interview Mark Schaefer, author of Return on Influence and The Tao of Twitter. He’s also a marketing faculty member at Rutgers University and he blogs at Grow. Mark shares how he uses Twitter to create stronger business relationships and improve customer service. You’ll learn about the best Twitter tools and how they can fit into your marketing strategy. Mark explains that the amazing thing about Twitter is that it can do many different things. It’s a great learning tool and a place to keep up with the news. And the best approach to using Twitter is personal networking. When he talks to clients, he asks them, “Are you the type of business that can benefit from going to a Chamber of Commerce meeting or a local networking meeting?” If you are, then yours is the right kind of business to be on Twitter. If you are the type of business that can benefit from personal networking, Twitter should be something you consider. Mark uses Twitter to build relationships. Small talk on Twitter goes a long way toward building brand loyalty. The unique aspect of Twitter for business is that you can find people. It’s difficult to find people and build a following for your blog or on Facebook. On Twitter, it’s easy. In Mark’s book, The Tao of Twitter, there’s an entire chapter dedicated to finding relevant targeted people to follow on Twitter. They don’t even have to follow you back. You can start to build your audience on your own and learn from people and connect with them. Just add a comment here and there. There is great power in being able to retweet. “Retweet” simply means you re-share someone else’s content that they posted in a tweet. When you do this, it does a couple of amazing things. First of all, it’s like saying, “Thank you! Good job! I appreciate this content!” and second, it helps you to get on their radar. If you do a good job of surrounding yourself with a relevant targeted audience, this audience will provide you with great content. You’re now able to create value for your audience through the content of others. After you retweet someone a couple of times and make an attempt to engage, they’re going to notice you. It’s a wonderful way to build your audience, network and connect. It’s networking on steroids. Mark’s policy is to follow people back because you never know where it’s going to lead. The great thing about Twitter and social media in general is that you can make it into anything you want. There are no rules. The strategy that Mark follows is that if you’re a legitimate person trying to connect, the other person will follow you back because that’s the real value of Twitter. Listen to the show to find out about how the code in the Retweet button works. 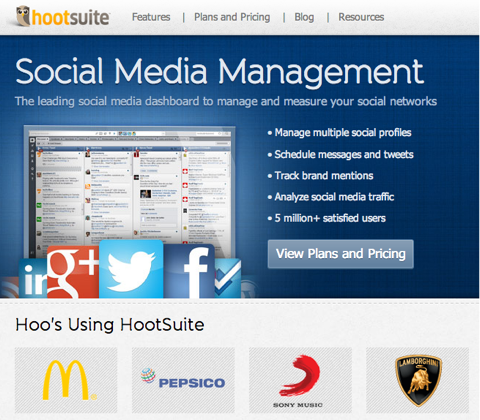 Mark feels that there are many great tools out there, but the main one he uses is HootSuite. Mark uses HootSuite to segment his lists. Twitter can quickly become an unmanageable wall of noise. To help with this, Mark’s advice is to segment your Twitter followers into lists. This way you can avoid missing anything from the people you learn from. It’s a very powerful platform. There is a Free version and a Pro version. Mark also uses ManageFlitter to help manage his account. It can help identify the spammers following you and it will also help you find people who are inactive. Listen to the show to find out more about how ManageFlitter could work for you. One of the most popular activities on Twitter is customers complaining. There are many conversations on Twitter about you and your services/products. Mark believes it’s like the new 800 number. If you aren’t there to answer on the other end, then it can hurt your reputation. You’ll discover why a lot of the biggest brands literally have war rooms. They have screens around the room where they follow and monitor their social media activity all around the world. Some of the monitoring tools are very expensive and very sophisticated. They’re able to sift and sort the tweets and other social media content in many different ways. This has become a very important aspect for companies to address. Mark is involved with Tom Webster in a project called The Social Habit. 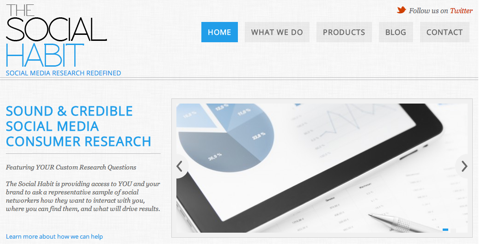 They use the resources from Edison Research to carry out social media research. The Social Habit report of September 2012 showed that 50% of social media users in the U.S. expect a reply to their complaint in an hour. One of the amazing statistics that came out in the report in September showed that 50% of social media users in the U.S. expect a reply to their complaint in an hour. The response time is getting shorter. Customers also expect a response 24 hours a day. This is an issue that Mark currently struggles with. Some of his customers have a call center that’s only open 9-5, 5 days a week. This is an adjustment we need to look at. This is part of the challenge of becoming a social organization. It’s not just about checking a box and doing social media. We also have to be in tune with how our customers are using social media, when they’re using it and what their expectations are. Then we need to make a business decision about how we adjust and adapt to these new conditions. We should look at how fast we react and how much money we put behind this type of service effort. There are some big decisions to make. 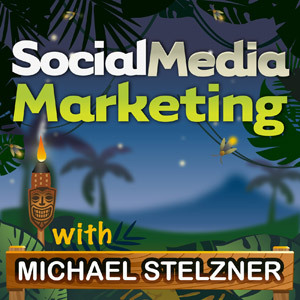 Listen to the show to hear examples of how Social Media Examiner uses Tweetbot. This upsets people who take this literally. Klout doesn’t know how influential people are at home or at work. Companies like Klout, Kred and Peer Index are trying to determine if you can create or aggregate content that moves through the web. In other words, can you create buzz? It may seem simple, but what they’re trying to do is complex. 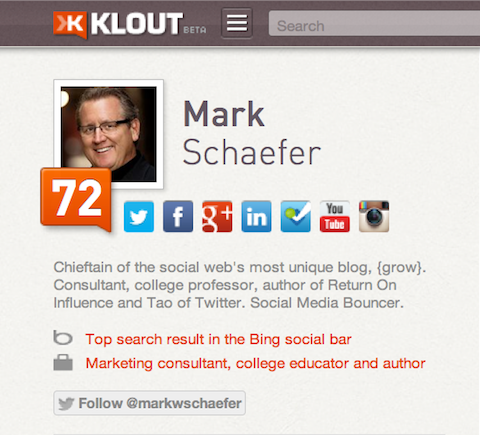 Klout scores aim to evaluate how likely the content you share gets shared on social media. Listen to the show to find out why we must view Klout like a credit score. Mark believes that although there are some hybrid approaches, there aren’t any rules. You can use Twitter any way you like. Some people look at Twitter as a wall of noise that’s bothersome. But Mark looks at it as a group of amazing people who, for whatever reason, have expressed some interest in him. Mark’s business partnerships and opportunities have come from some very unlikely places. It’s a place where you never know what’s going to happen. His strategy is to use Twitter as a global networking tool and the way to do this is to be as inclusive as possible. Lists can help you effectively manage this task. Mark has over 50,000 people who are following him on Twitter, so he must focus on his lists. Twitter lists also help him focus on the people in his streams. If someone attempts to build a relationship with Mark, he’ll put them on a list. And every day he watches a bit of what they’re doing. You’ll also discover why Mark finds the unfollow trend interesting. Many people with massive amounts of followers are unfollowing people because they feel Twitter is not working for them anymore and they want to try something else. In 2009 when Twitter became popular, it almost got obliterated by spam. The same applied to Quora in 2010 and Klout in 2011. Mark feels it’s a lesson for any startup in this space. Social media startups have to think about countermeasures and control spam. If you start to get popular, how are you going to handle the spam? Listen to the show to hear how Twitter is now doing a much better job culling out the spammers. Mark shares how Twitter is looking for every opportunity to monetize their platform. In the past, many companies were creating wonderful new applications built on Twitter’s data. But Twitter gave the developers 18 months’ notice before they pulled the plug. So these companies can no longer access Twitter’s data. A lot of these companies are hurting and a few of them have even taken legal action against Twitter. Listen to the show to hear more about how Twitter is monetizing their platform and how they are working with other companies. Mark states that people don’t want all the marketing. People are sick of being advertised and sold to. If you go on Twitter and you try to sell, sell, sell, advertise and market, people are going to tune you out. His advice is to be patient and be consistent and methodical in building an engaged audience that’s interested in you. So when you have an event, they won’t be surprised and will support you. If you naturally interact and inform, then people will be attracted to you. Listen to the show to hear how marketing is simply just telling people about something. One new thing that Mark finds really interesting, even though it goes against everything he has just been talking about, is that certain businesses are creating entertaining personas. You’ll hear examples of a taco company in the Pacific Northwest that created a wise guy taco that shared funny comments. There was another company that created a persona of a shopper, where you can follow her shopping experiences in NYC. It was all fake. Even though people knew it was fake, they were telling a story through Twitter. Another example is Coca-Cola, one of the wisest and most conservative marketers in the world in many ways, has created a Twitter account for their founder, Doc Pemberton. It’s an account where he makes fun of himself, even although he passed away a long time ago. 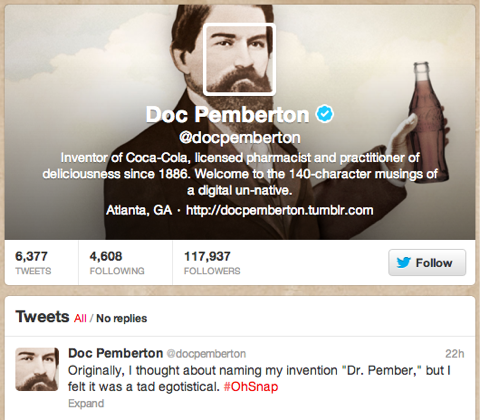 Coca-Cola has a Twitter account for their founder, Doc Pemberton. Mark finds it a really interesting nuance. It’s entertainment. And as we know, entertainment is important because we try to compete in an information-dense world and it’s getting denser by the day. Maybe making fun of ourselves is a way to cut through and get our messages heard. Mark says this little micro-trend has taken him by surprise and he finds it interesting. Mark encourages you to give Twitter a try if you are just starting to explore social media. If you get confused, take time to read Mark’s book. Listen to the show to hear why Twitter is like a blank piece of paper. 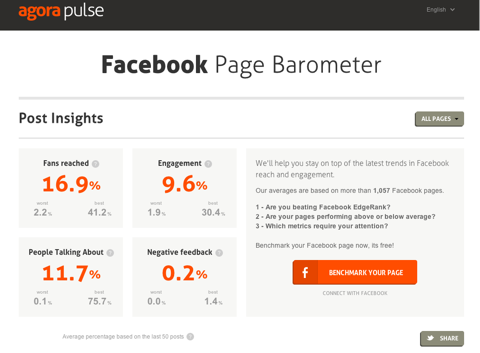 There is an interesting new free tool by AgoraPulse called Facebook Page Barometer. You can connect your Facebook account to the site and it runs an analysis of your Facebook Page against hundreds and potentially thousands of other Pages that are inside of this particular network. AgoraPulse's Facebook Page Barometer is a great free tool to analyze your Facebook Page against competitors. You can then compare these results with other Pages in the categories you choose. Some of the people who will be presenting at Social Media Marketing World include Mark Schaefer, Guy Kawasaki, Mari Smith, Chris Brogan, Jay Baer, John Jantsch, Dave Kerpen, Sally Hogshead, Michael Stelzner, Mitch Joel, Lee Odden and Jesse Stay. What do you think? What are your thoughts on using Twitter for building business relationships? Please leave your comments below.